Need to add a little green to round out your superhero team? 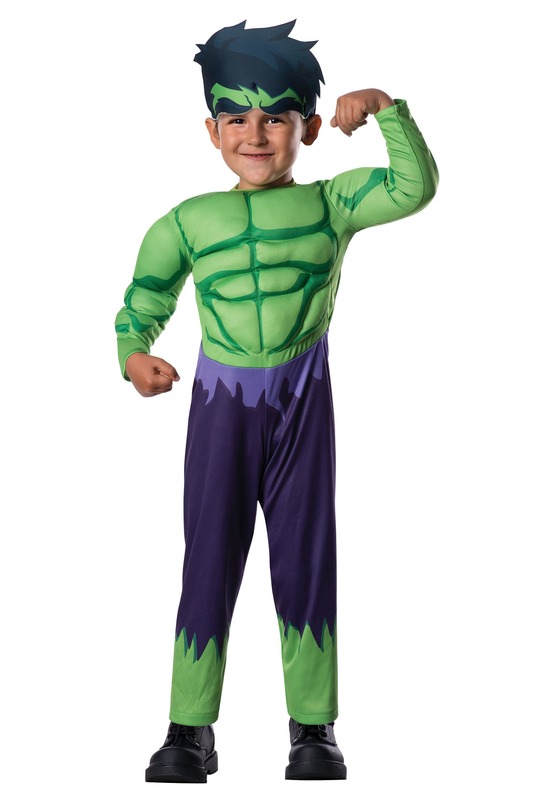 Then it's time to suit your little one up in this Toddler Hulk Costume! Based on the Marvel Comics character, it comes with big green muscles on the front along with a head piece that lets your kid "get angry" whenever the next bad guy shows up! It's the best way to have your child looking like a bonafide Avenger and you don't even need to become an expert in gamma rays to do it. Bruce Banner doesn’t even hold a flame to your little monster! I mean really, have you ever seen anything cuter than a small child getting angry? Yeah, we haven’t either, our Toddler Deluxe Hulk Costume is the perfect costume choice this year! We’re sure your little toddler is already a force to be reckoned with so why not get him or maybe her, an adorable green muscle suit to really show off their superhuman strength. If the deluxe jumpsuit and hat isn’t enough for your green giant then don’t worry parents, we’ve got oodles of Hulk accessories that are fit for a superhero. Grab our Hulk makeup kit or a pair of our Hulk or gamma fist gloves to give your little one the complete hulk look. The others children are sure to be green with envy!